Over the last few years, I’ve really given a lot of thought to what it takes to get rich and grow wealth. I’ve spoken with countless millionaires, I’ve coached clients through my programs, I’ve helped people on my forums, and I’ve responded to over 5,000 reader comments on this site. In each instance, there are common themes that are either helping the person grow wealth, or preventing the person from getting rich. Being rich doesn’t always mean having money, but 90% of the time it does. However, there are habits, behaviors, and “rules” essentially, that will allow you to get rich and grow wealth. It’s not an overnight process. There aren’t any get rich quick schemes here. 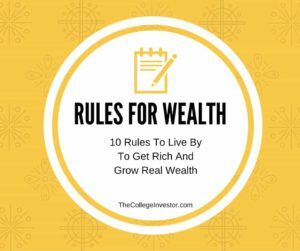 What you’re going to read below are my ten rules for getting rich and growing wealth – over time. If you want to get rich and grow wealth, you have to earn it. There’s no way you’re going to get to what you want and where you want to be if you’re not trying to get there. With money, this is pretty darn straightforward. You want money? Get out there and start making it. Get a job. Get a second job. Get a third job. Start side hustling and doing side projects to make more money. Are you in college? Get a side job in college to pay for school. The bottom line is, if you want to grow wealth, you have to earn income. There are potentially thousands of ways to earn income, and you need to find the most that you can do and get to work. There is nobody stopping you. There’s nothing in your life preventing you. The only roadblock to you earning more is yourself. 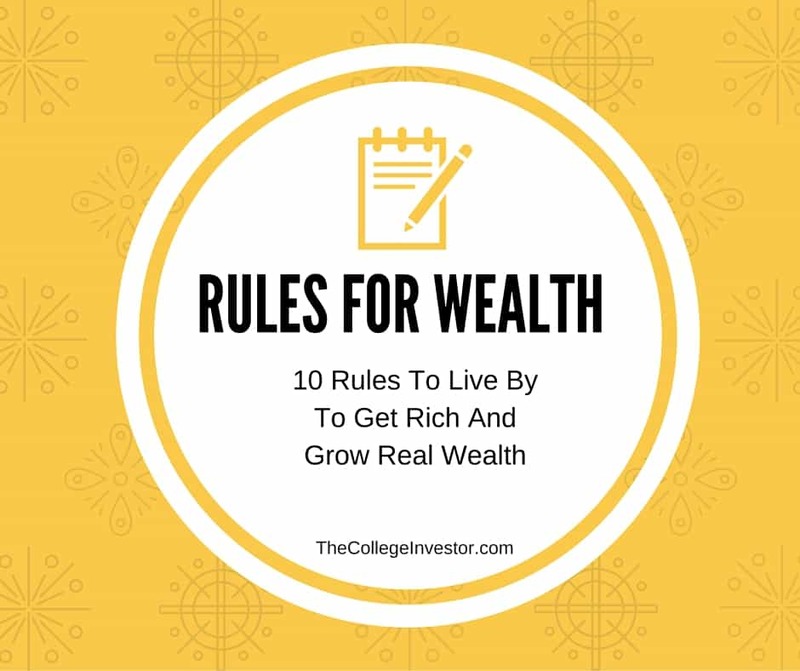 So, stop with the excuses and focus on rule #1 to get started – you have to earn your wealth. The second rule to getting rich is saving. It’s not enough to just earn money – you have to save it as well. Otherwise you’ll just end up like any number of famous celebrities who’ve gone bankrupt. Income alone just doesn’t cut it. You have to save. But the real “rule” to get rich here is saving until it hurts. How much is that? Well, if you’re not hurting yet, it’s not enough. For example, last year, I saved roughly 40% of my after-tax income. Sounds like a lot, doesn’t it? But there are plenty of people out there that are saving more – many over 50% of their income if not more. The truth is, following Rule #1 makes this rule easier. The more income you have, the easier it is to save more. But even on lower incomes, you can still save. Here are 15 ways to save an additional $500 per month. Boom! The third rule to grow wealth is to optimize your spending. I’m not one to judge your spending – spend more or spend less. My personal belief is you should buy whatever you want – just earn more money so you can afford it. But no matter what, truly wealthy people optimize their spending. This means they find good deals – even if they are going to buy a Ferrari, you can bet they searched around for a deal and negotiated the price. The trick here is to simply spend wisely – especially on your biggest expenses. For most people, this could be cars, insurance, healthcare, and more. Too many people here just opt for “whatever” or don’t think about what the choices really are. Wealthy people stop, think, and elect a choice that maximizes their benefits while minimizing their expenses. So, if you’re ready to grow wealth, start identifying and optimizing your spending. The fourth rule is that you have to put your money to work for you. Earning it is your part of the heavy lifting. You need your money and the power of compound interest to work together over time to grow wealth for you. What does this mean? It means that you need to invest. Why? Because the average inflation-adjusted return for the S&P500 for the last 60 years has been 7%. You need your money to grow and earn you more money. You need to start building income streams with your money. The goal is that your hard work up front can help you build passive income streams for the future. Do you want to earn $50,000 per year without working? Here’s a simple breakdown of how to make your money work to do it for you. It’s all about making your money work for you, not against you. The fifth rule for building wealth is to marry smart. Why? Because a great spouse can be a huge force multiplier when it comes to building wealth, while at the same time the biggest destroyer of wealth is divorce. In fact, a recent study found that divorce destroys 75% of personal net worth. On the building wealth front, a great duo can earn together, accumulate together, and watch their double-earnings compound over time. That’s a huge force multiplier for building wealth. The interest on $2 is always higher than the interest on $1. However, divorce has the potential to ruin financial lives if you didn’t marry smart. Beyond dividing things 50/50, there can be lawyer fees and more. Plus, compound interest now only has a small amount to work with – so it just grows slower. The fact is, though, that according to the American Psychological Association, 40-50% of marriages end in divorce in the United States. That doesn’t mean that divorce has to be a financial disaster. If you married smart to begin with, hopefully your ex-spouse will also be financially savvy when it comes to divorce and you can work things out as amicably as possible. The sixth rule for getting rich is always be minimizing your tax liability. No matter your income level, you always need to be thinking about how to minimize your taxes. Taxes can prevent you realizing wealth over time because they consistently eat away at your income and investment returns. For example, the S&P 500 posted an average annual nominal return over the last 30 years of 11.09%. However, after taking into account taxes, fees, and inflation, the real return an investor would have seen would have only been 5.97% according to this report. That’s 46% of your return eliminated by taxes, fees, and inflation. However, there are many actions you can take to minimize your taxes. First, take advantage of tax deferred investment accounts. Max out your 401k or 403b, take advantage of an Individual Retirement Account (IRA), leverage a Health Spending Account (HSA). If you don’t want to give up your wealth to the government, then taxes should be near the top of your mind when making any money decision. The seventh rule for getting rich and building wealth is that you need to insure yourself to protect your wealth and your family. I’m not even talking about life insurance here – I’m talking about making sure that you have health insurance and disability insurance. In the last year, I’ve had two coaching clients that have been impacted by health issues they weren’t prepared for, and they’ve become financially jeopardized by them because they didn’t prepare. I’ve also had another several instances of people becoming disabled to the point they or their family member couldn’t work any longer. The result? Financial peril. Check out Ethos to get a quote on term life insurance in minutes. They are an online life insurance company that can give you excellent rates. Check out Ethos here. Don’t watch all of the money you have accrued go away in a moment. The eighth rule of building wealth is to take care of yourself first. This isn’t as much of a money rule as a life rule. When you fly on an airplane, the flight attendant always does their safety speech where they remind you to put your oxygen mask on first before helping someone else? There’s a reason for that – if you’re unconscious, you can’t help anyone else. When it comes to building wealth, you have to take care of yourself first – even when dealing with family. This can be really hard for some people, especially those that didn’t have much, and now have something that they could share. And others may realize it and ask. If you want to help others, make sure you’ve put yourself on solid ground first and have followed all the rules. I’ve seen it too many times where generosity leads to financial ruin. The ninth rule to get rich is to surround yourself with people better than you in all aspects of your life. On the family front – if they are holding you back, distance yourself. Married upward. Don’t let family be the reason you aren’t achieving your dreams. Friends? Find ones that are making you a better person. Drop the moochers. Drop the haters. Drop the lazy ones. Work? Find a mentor that is doing what you want to do and is killing it. If they don’t have the bandwidth to meet you, just watch them and see what they do. You can learn a lot from a distance. Just like Rule #1, you have to earn it. Find people that will help you with that. You don’t have to settle for the life you were born into if that’s not what you want. Finally, the last rule for building wealth is, remember it’s okay to go slow. This is especially true for millennials. I feel like everyone under 30 today wants the next thing, the next job, the next milestone, the next big paycheck. But they haven’t even done this thing, learned this job, achieved the current milestone. Building wealth takes time. It’s about earning today, and leveraging time tomorrow. That’s how wealth is made. Even if you landed a $150,000 per year job today, you’re not any wealthier. Your first paycheck at this great new salary might be $5,000 take home. That’s not wealth. That’s a starting point. That’s something to build on. According to The Spectrum Group, the average millionaire in the United States is 62 years old. Just 1% of all millionaires are under 35. Keep that in mind on your wealth building journey. What financial rules do you live by? Max out your 401K, max out you IRA, and build up your savings. Those are the first things someone out of college should concentrate on. But sometimes it’s really easy to focus on buying a fancy car or new clothes. Don’t! Don’t buy depreciating assets. Buy appreciating assets. I agree on that don’t buy depreciating assets, but you do need things like a car. However, you don’t need a fancy car unless you can truly afford it. I wish I had taken that advice after college. Rule #5 is a huge one. I lucked out with my wife by accident – she loves going to yard sales and saving bundles of money. We both are just natural savers that bumped into each other :-). You really did get lucky… I know too many guys who got married and their wives ended up being total spendthrifts (they never discussed anything related to finances before they were married). Spent them into the ground and then some, and most of them are divorced now. Just a total disaster all around. What an awesome article. For a long time I didn’t understand what kind of “hard work” is involved. You can spend a lot of energy in a rocking chair going back and forth but you aren’t going anywhere, or you can get on a bike and spend that energy going somewhere. Hard work is very important but you have to be doing useful work to get where you want to go. That’s an awesome analogy about rocking in a chair. So true. Of these my favorite is ‘you need to save until it hurts.’ People often wonder whether they’re saving enough. How to know? I think you need to save until, as you say, it hurts, at least a little bit. If you’re not forgoing at least one purchase a day, you’re probably not saving enough. I agree – it’s not about living in poverty, but it is about making small choices today to live better tomorrow. You did an amazing job here. You essentially gave away my recipe for financial success ( or even at life we could say!) and I couldn’t agree more on the rules themselves, but also the order and the way you interpret it. I love so much your way for defining the ideal saving rate : It has to hurt! It must force you to make an effort. You nailed it and it is so accurate. Only when an effort is required can there be progress, which is essential when trying to tackle life goals like becoming financially independent. Thank you for sharing your knowledge and providing an opportunity for anyone searching an answer about building wealth, which is serious, credible and accessible. It doesn’t matter how much debt you currently have, or how little investments you have. the only thing that matters and that you control is your next action. Are you going to start taking concrete actions to secure your finance ? If the answer is yes, then the list is yours! Wish you continued success and looking foward to reading other great articles like this one Robert.